Back in August Yoyo Yeung’s “The Kenneth Fox” made its debut at Summer Soul 2018. Yoyo Yeung has recently emerged as one of the hottest new prospects in the next generation of young artists immersing themselves in the world of Art Toys. The artist behind the ever so adorable Yoki. 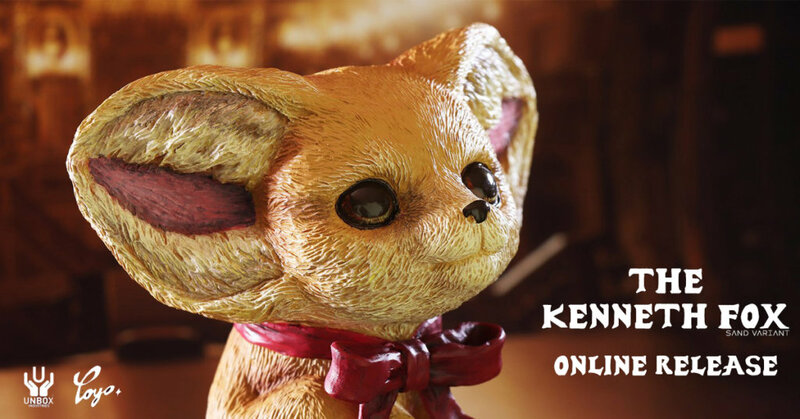 Yoyo presented her first in a series of collaborations with Unbox, after many Asia conventions “The Kenneth Fox” will finally be made available online. This Sand Variant of The Kenneth Fox presents a lighter shade to the original but still comes with the walnut base that is individually numbered by laser engraving. The limited edition of “The Kenneth Fox” as previously seen in her publication about the character Influenced by her time studying in the UK and her passion for vintage English illustration. Yoyo sculpted her character in a completely different style from her recent works with the intention of branching into a brand new direction that will compliment her existing body of work in soft vinyl. Each figure is presented on a walnut base that is individually numbered by laser engraving. LIMIT ONE DESIGN PER CUSTOMER. THANKS! We hope to see Kenneth Fox in a full figure format in the near future. Would you like to see Kenneth Fox in a full soft vinyl figure? Answer in the comment section below.